The Story of the Di Bruno Bros. Easter Pie | Blog | Di Bruno Bros.
Posted March 28, 2019 by Di Bruno Bros.
For the last 15 years, we have been making this rustic holiday dish. This classic Italian Easter recipe has been passed down through our Di Bruno Bros. associate family for generations. What is this magical Easter pie? Filled to the brim with a plethora of meats, eggs, and cheese, Easter Pie (also known as Ham Pie or Pizza Rustica) is truly a celebratory dish that stands in contrast to the more modest meals traditionally consumed during the previous 40 days of Lent. It’s enjoyed as an appetizer, morning or late-night snack for the whole week leading up to Easter Sunday! 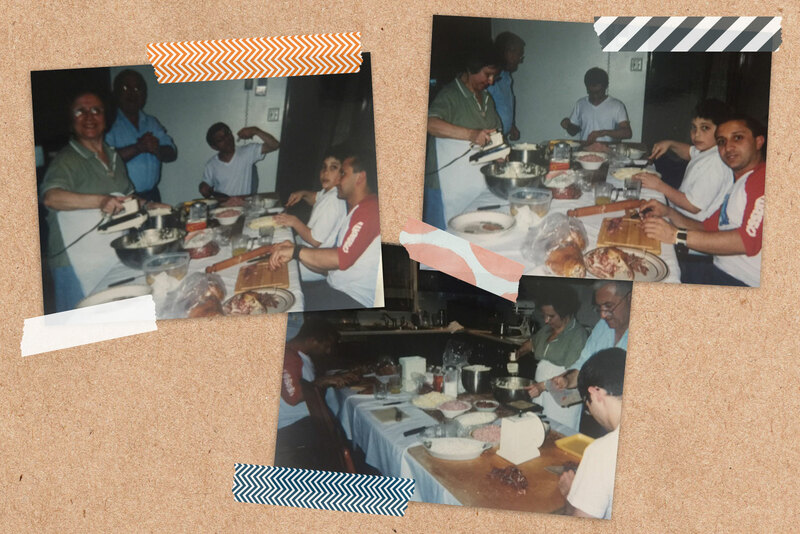 Johnny Zancolli, our senior retail leader, has graciously shared his mother’s holiday recipe for what is also known as “Pizza Rustica.” Mama Zancolli, as we like to call her, hails from Abruzzo, Italy, just like Danny and Joe Di Bruno. “It’s one of Mama Zancolli’s best creations and family traditions, that we hope will carry on and on in our family,” said Johnny. 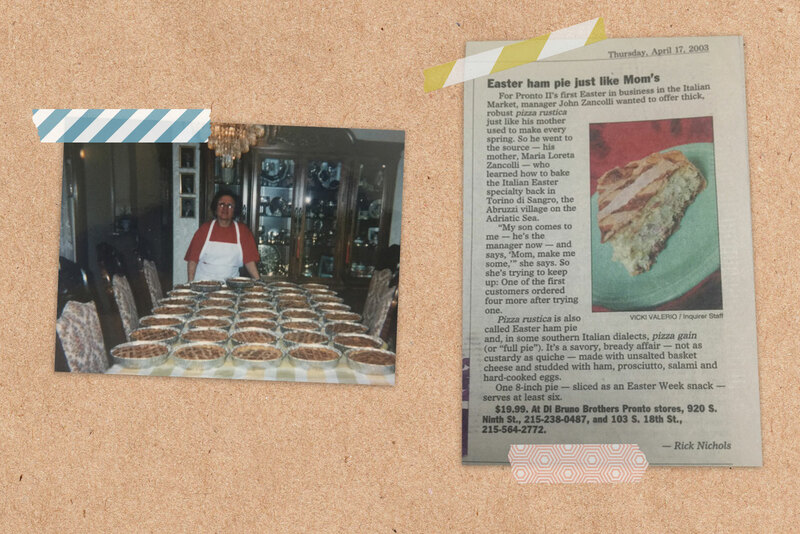 “Every year, about two weeks before Easter Sunday, we start to prepare the Easter Ham Pie. Like you see in the pictures, everybody is responsible for prepping and picks an ingredient to work on. My two brothers, Alfonso & Franco, my sister, Assunta, my nephew AJ, and Mom & Dad all help in creating this Easter tradition. This year, we are also getting help from the newest generation in our house, my nephews Giovanni, Michael, and my niece, Sofia,” said Johnny. Johnny’s mother learned how to make this Easter-time treat in Torino di Sangro, an Abruzzi village bordering the Adriatic Sea. Our very own Executive Chef James Liuzza has been following Johnny’s mom’s original recipe for years. You can find them in any of our shops starting on 3/23! Another prosciutto that you fancy! Preheat oven to 350˚ F . Dice the meats and the hard boiled eggs, and grate the Parmigiano. With a wooden spoon, mix in the raw eggs (except for one), Ricotta, Basket Cheese, herbs and spices to make your pie filling. Fill each pie shell. Cut the top crust into lattice pieces and place over the topping, pressing into the bottom crust around the edges, and trim any excess. Brush the lattice with raw beaten egg. Bake for 60-70 minutes until set and lightly browned. Allow the pie to rest for 10-15 minutes before serving. It was so great to see this recipe and the history. My grandmother, who’s parents came from Campania, made this, and I make it now, but mine is much smaller. She used to use 18 eggs and baked hers in a 20″ wide round pan that was 4″ deep (we have a large family). My recipe is almost the same as yours. Thank you for sharing this special treat. Our family does the Easter pies also but we have both sweet and savory. My grandmother did one with rice or just the hard boiled eggs. Also one with more of the harder cheeses like parmaigiano. Thanks for sharing!!! As a long time family friend, I have been fortune enough to have eaten this many times over the year’s, and I can say that it is absolutely delicious, and never disappoints! Hello Di Bruno’s family !! Now my challenge will be to bake that delicious pie one of these days”” Gracie Mille famiglia and happy holidays, Davide. I have been looking for a store, bakery or person(s) that would make the ham pie with the crust. Yay I finally found one. Do I have to put in a request for one or can I just come to your CC store and one up there. Please let me know. Thank you. Please note that our Rittenhouse Store’s prepared foods and charcuterie phones are temporarily out of order. Please dial the cheese cave, and they will forward you to a prepared foods associate if you ask for assistance there. Have a great day! All the old time Neapolitan men we grew up with in Brooklyn made bsdketncheese from goats milk. Honestly it is soo very good. I make it once in a while st my California home. We eat it the next day with breakfast making wedge slices and dipping it in our bees honey. Thank you soo much for sharing this recipe.